Windows operating systems come with basic file types and extension association management tool, which only has the basic function of changing and assigning default app or program for each kind of file type, extension, or protocol only. Default app or default program is used to open the file or document, which is the default action when user open the file directly, either by double clicking on the file, select and hit ENTER key, or select Open entry from right click context menu. Unlike Windows XP, beginning from Windows Vista and continuing in Windows 7, Windows 8, Windows 8.1 and Windows 10, Windows OS does not have the Folder Type tab anymore under Folder Options, nor anywhere else. 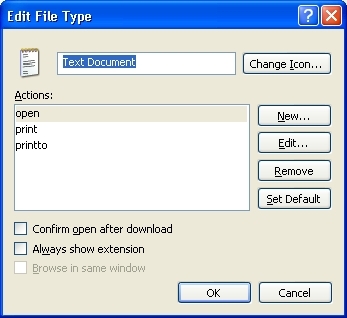 Previously in Windows XP, the Edit File Type (shown in figure below) allows user to create, modify (edit) or remove (delete) actions associated with the particular extension or file type, and further customize what’s the action will do. These actions will appear on right click context menu options for the kind of the file for user to select which one to execute. User can also set an action such as Open or Edit, as the default action to perform when user simply open the type of file or document. This advanced editing feature for file associations and their related actions have been removed from newer version of Windows though. 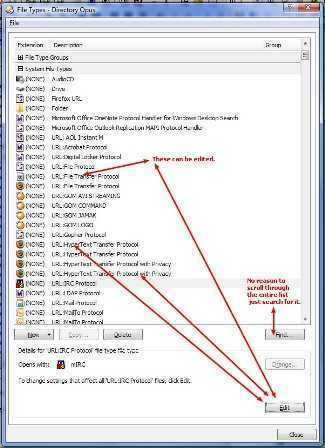 In modern Windows, only default program or default app, which is called when the kind of file is opened, can be edited and changed. Although all file associations and actions are stored and saved in registry under HKEY_CLASSES_ROOT registry branch, however manually editing the registry to edit, manipulate or change the file associations is complex task, as the registry keys are defined in DDE, OLE, and CLSIDs for various COM components and handlers involved. As such, third party application program utility which able to manage and edit the file type associations is recommended. 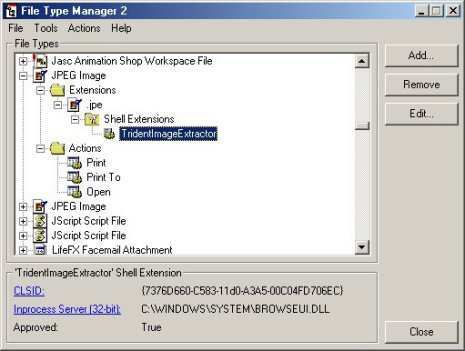 This article explores some freeware advanced file associations and actions management and editing tools that can virtually helps user to configure and customize whatever thing related to file type and extension program association. Unless specifically mentioned, all of them is available free of charge. Update: Creative Element Power Tools has been discontinued. Creative Element Power Tools is a collection of productivity tools for Microsoft Windows 7, Windows Vista, Windows XP, Windows Server 2003, Windows 2000, and Windows Me. 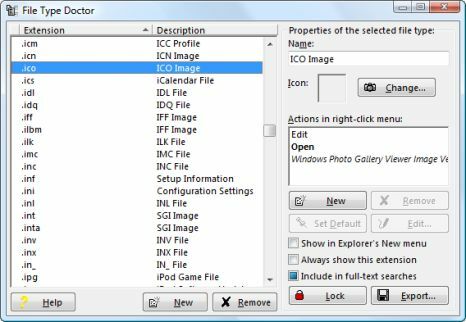 One of the file utility is File Type Doctor which allows user right-click any file and select Edit File Type to modify the applications used to open files of that type. Use File Type Doctor to choose default programs, add or remove file types from Explorer’s New menu, and customize files’ context menus. Download and install Creative Element Power Tools. Open the Creative Element Power Tools Control Panel. Turn on by ticking the check box of the Edit file type associations option, and click Accept. Right-click a file of the type you want to change, and select Edit File Type. File Type Doctor will be opened, which user can edit the file associations for the type of file extension as needed. Update: SAPIEN FileTypes has been discontinued. A graphical utility to help manage the file type associations which determines what application opens what documents on Windows system. Especially useful for re-associating files with PrimalScript (or another application) if they’re not correct. 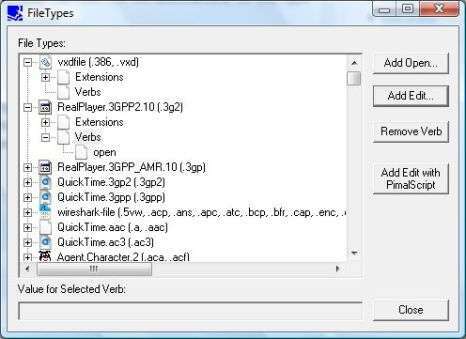 Only allows user to add Open and Edit actions (verbs). Update: Spearit Associate This is no longer available. Features Association Monitor that watches for changes to file associations in background, Open Tracker that allows opening file with list of program choice selection, Association Detective to search for programs support the types of files, Backup and Restore file associations, Task List and Extension List which offers detailed information regarding file extensions and associations. Costs $19.95 to buy, but available for free download as fully functional 30-day trial. File Type Manager or RTM by Frank, is a Windows utility program to manage Windows file types, actions and shell extensions. It offers far more functionality than similar programs or the built-in Windows tool. Apart from that it is one of the only programs available that able to manage shell extensions. Works in 32-bit and 64-bit Windows OS. Download File Type Manager 2.0.1. Update: ASHociation is no longer available. ASHociation is a file association report and editing tool. Costs $14.95 for registration, but it’s free to use with reminder to register, and has no time limit, although some features may not be available. Download ASHociation. Current version is 1.2. Directory Opus (or “DOpus”) is a file manager and explorer replacement program with full support for user definable and customizable file types. Directory Opus is selling for AUD $85.00, but a fully functional evaluation version of Directory Opus for 60 days is available for free. 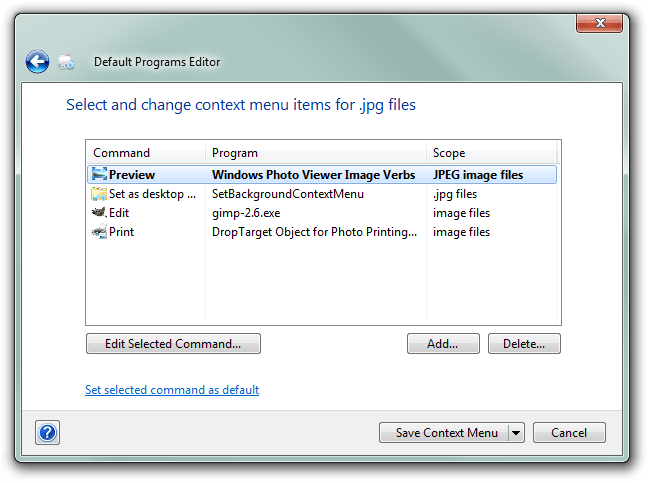 Default Programs Editor makes it easy to fix file association settings in Windows, including context menu items, icons, and descriptions. It also supports managing of autoplay settings and default programs settings, all without fiddling around in the registry.